The first two sections describe the position and some of the challenges in determining who lived where. The properties section provides links to each property. The northern side of the High Street running up to Ealing Road (previously ‘Drum Lane’), with the Red Lion on the Ealing Road corner until 1970 (S23). Albany Parade shops occupy part of this area (A37). Osier Court, built in the late 1980s, now occupies the area running up to Ealing Road (S23). The 1939 Register has details of residents for numbers 297, 301, 302, 303, 304, 306 and 318, but not 298-300, 305, 307-317, suggesting some redevelopment had taken place, or use as premises rather than homes. If I were to start afresh I would have split section 26 into two, the first part (26a) covering numbers 297 to 307, with a break at the entry following no. 307 (the Alexandra beerhouse), and (26b) numbers 308 – 318. Censuses for 26a fit OK, the challenges appear in 26b: more properties recorded in the census than those on the High Street. I originally created two properties 309-1 and 309-2 to accommodate the overflow, but looking at a map this does not make sense, numbers 309 and 310 having no entry between them or on either side. Number 313, with an entry to its east, had a cottage in 1909/10 and assuming this was occupied does solve some of the inconsistencies. 22 house numbers were allocated in 1876. The 1894 OS map shows 23 properties, the Red Lion having an entry on its west and being set back a little compared to neighbouring properties to the west. The 1865 OS map shows 23 properties. The tithe map (1839) is colour coded to distinguish dwellings from outbuildings, workshops etc. Allowing for what appear to be entries between properties, I counted 22 residential properties and one workshop. The 1841 census includes details of 23 properties plus 3 uninhabited properties. There are 24 houses recorded in the 1851 census between St George’s Court and Drum Lane. Several members of the Sanders family lived in this stretch from the time of the tithe return through to the 1940 directory from a hundred years later. See notes under numbers 303 to 307 and also the Sanders family page. The Howard family ran another long-standing business (over 100 years) at 298 to 300. A house and yard on the corner of George’s Court (or St George’s Court) (tithe enumeration). There were changes of occupant in each of the earlier censuses. In 1841 there were 11 people listed in the property, surnames Crew, Kniblett, Green, Dumbarton and Knight. In 1851: Leonard Brown, labourer; 1861: Edward Catchpole, formerly job master; 1871: William Wills, refreshment house keeper and George Dorey, stonemason. By 1881 Mrs Amy Wills, midwife lived here followed by Henry Harris, coachbuilder & wheelwright (1890). See Pauline Tate's notes on the Harris family. He too had moved on by the time of the 1891 census and George Hearn, coffee house keeper lived here with his wife and son. The property was used as a greengrocers for the next 40 or so years, run by John Powell (1901 & 1907), Arthur Lord (1913). In the Valuation January 1915: a semi detached house and shop with passage way to George Court on the flank. Side and front and back elevations want pointing. The premises are now to let and would require redecorating to let to a new tenant High Street frontage 15'4". In 1928, 1933 John William Hancock (greengrocer) and Mrs J W Hancock in 1940. These two properties were eventually used by one business (Howard’s ironmongers). The tithe enumeration ref. 312 was a house workshop and yard owned by Ann Thick. This may have been numbers 298 and 299, 298 (coloured grey) was presumably the workshop, 299 (the house) was occupied by Thomas Thick, wheelwright in the 1841 census. A Howard is listed as living in one of these properties from as early as 1861, when 35 year old Daniel Howard, whitesmith employing 1 man was at (as far as I can make out) no. 298. Next door at 299 was William Prebble, beershop keeper. By 1871 299 was occupied by a farrier/wheelwright Joseph Meakes (hence the reference to the forge in the 1909/10 Valuation Return below?). By 1890 Daniel Howard & Son ran their ironmongers business from numbers 298 & 299, to be succeeded by Henry T Howard in 1891 & 1901, ‘Howard & Sons, ironmongers’ in a 1907 trade directory. In the 1909/10 Valuation Returns 298 & 299 are recorded under one reference no. and no. 300 separately as each had different owners. Numbers 298 & 299, owned by Mrs L.C. Stevens of 102 Barrowgate Road, Chiswick, were a shop, warehouse, house and premises with a frontage of 34’ 7” to High Street. The properties were copyhold to Ealing and a term of 21 years from 29 September 1895 applied, annual rent £60. 298/9 was a two-storey terrace house and shop with 5 rooms a WC and low basin on its top floor. On the ground floor it had ‘one very long shop and one large shop, one store room & archway’ and was ‘chiefly used for storing ironmongers goods’. The premises were in ‘very fair repair’ and had ‘modern drains’. ‘Part of shop fronts extend beyond main building line’. At the rear of 298 and communicating with the shop of 298 was a large timber built warehouse with large loft over. Also at rear a workshop with forge & another warehouse, large yard and 1 or 2 sheds. In the 1911 census each of numbers 298-300 was described as a ‘lock-up shop’, occupier ‘Mr Howard’, none were used as dwellings. This painting of the property was by Ruth Howard, wife of John Howard MD at the time - thanks to Hugh Hughes for this information (Jan 2017). Numbers 298-300 were ‘Howard & Sons, ironmongers’ in 1913, 1928, 1933 & 1940 trade directories. 1964: ‘Howard and Sons (Brentford) Ltd., Engs, Stores, Irnmgrs 298 High Street Brentford (phone no.) ISLewth 3262’. 1967: the same company (Engineers Stores) was trading from 8 - 10 London Road using the same phone no., so had moved to the opposite end of Brentford. Douglas also provided this photo of a painting showing the shop seen from Goat Wharf, across the road. Phone directories show Howard & Sons, Engineers Stores & Ironmongers remained at no. 298 until 1964 (telephone ISLeworth 3262). By 1967 the same business was trading from 8 – 10 London Road, the opposite end of Brentford, and photos (see links below) confirm numbers 298 – 300 were demolished in the mid 1960s. In this area were three houses and premises owned by James Over, who also occupied one of the houses in the 1841 census: they probably became numbers 300 – 302. Number 300 was used by John Lightfoot, glass cutter (1861), Benjamin King, writer & (en? )graver (1871), George William Reeves, who is described variously as a carpenter, builder & undertaker in 1881, 1890 & 1891. In the 1909/10 Valuation no. 300 was recorded as a shop, house and premises owed by A.J. Banyon, Arnwell Villa, Woodlands, Isleworth, also copyhold Ealing, yearly rental £20. It was a terrace house and shop of two storeys with 2 rooms on the top floor and on the ground floor a shop, store room and scullery. It had a very long warehouse at the rear and was in very fair repair. It had High Street frontage of 11’ 6”. The first floor of 300 was approached through 298/9 & ‘both floors (of 300) communicate with 298/9’. Later no. 300 was ‘Chipperfields, Upholsterers’ Sundries’ (Official Guide ca 1953). Photos (see links below) confirm numbers 298 – 300 were demolished in the mid 1960s. Alfred John Banyon, 58, retired licensed victualler, born Isleworth, lived at Arnwell Villa, Woodlands, Isleworth with his family and a servant at the time of the 1911 census. Occupancy before 1861 is unclear, but by the 1861 census Mrs Mary Cartman, a locally born widowed dressmake of 44, was living here with her daughter Georgiana W, 19, also a dressmaker. A cousin, Jane James, age 2 and a road contractor from Lancashire boarding with the family, made up the household of four. Mary Cartman remained at this address through to 1901, by which time she was 86, the sole occupant of 301 and ‘living on own means’. No reference to no. 301 in a 1907 directory, possibly it was not occupied. In the 1911 census no. 301 was occupied by Henry Grubb and his son Stuart, both gas fitters, the father had a shop, the son worked for the Brentford Gas Company. They occupied just two rooms. The remainder of no. 301 and no. 302 was occupied by the Humphrey family – see 302. Trade directories from 1913 to 1940 show Henry Humphrey, picture frame maker, working from this address and no. 302. Initially (1839) a booksellers, run by James Over; in the 1845 directory he is a picture dealer & bookseller; there is a PCC will of a James Over in 1853. By 1861 Matthew H Humphrey, photographic artist lived & worked here. Known as Henry Humphrey by 1871 he remained here until 1874. By 1881 his widow Mrs Ellen Humphrey was using the premises as a greengrocers and she is listed until 1891. By 1901 her son Henry Humphrey, picture frame maker was the head of household and the 1911 shows he, his wife, four children and mother Ellen (age 79) at both numbers 301 and 302 occupying 6 rooms. The 1909/10 Valuation shows 301 and 302 were both owned by A J Banyon, along with no. 300. The description for 301 and 302 is very similar suggesting they were built at the same time. Henry Humphrey is listed as using both properties for his business until (at least) 1940. In the Ealing tithe apportionment, 1840, George Sanders owned 4 properties in this area of the High Street. He was recorded at no. 307 in 1841, aged 55 (ie 55 to 59), occupation ‘H M’. In the 1841 census George Winter, barge master lived here. Vicki Powys points out a possible connection to Joseph Winter, also a barge master who lived at no. 258 in 1841, aged 45 (to 49). Number 303 was occupied by William Henry Sanders, agent and tax collector in 1851 and 1861, then his widow Caroline in 1871 – 1891. William was one of George’s sons: see the Sanders family page for more information about this family, which is being researched by two descendants, Fiona Sheehan who has been in touch since the early days of this project, and Vicki Powys, who has been in contact during 2007. A 1907 directory records Alfred William Carter at 303 High Street. In the 1909/10 Valuation the property was owned by a Mrs Kate S Saunders of 77 Argyle Road, West Ealing and let at 10 shillings (50 pence) a week. Kate S Saunders was the daughter of William H Sanders, Kate having married William Christopher Saunders. The property was a terrace house and premises of three storeys and a cellar. It had a large attic on the top floor, 3 rooms on the first floor and on the ground floor 2 rooms, a scullery, washhouse and WC. The OS map published in 1961 marks 303 as Ruin. In 1851 Joseph Winter, lighterman employing 4 men, age 59 lived here, probably the same JW who was a barge master at no. 258 10 years previously. His son Joseph Winter junior remained here in 1861, lighterman employing 4 men and 2 boys. Edwin Sanders, who was born at no. 305, lived here in 1891, when he was a clerk heading a household of eight. His wife Clara Ann (nee Heath) was from Windsor originally and was a schoolmistress in a private school in 1891. 304 High Street, Mrs E W Sanders, private school (1913 trade directory). The owner and occupier at the time of the 1909/10 Valuation Record was E W Saunders. Their son Alfred Wilson Sanders continued to live here (1928, 1933 and 1940 trade directories). 1952 electoral register: Alfred W Sanders, Edwin E Sanders, Frank E Sanders and Sarah A Sanders. See the Sanders family page for more information about this family. The property (in 1909/10) was an old terrace house of three storeys with a cellar. It had a large attic on the top floor, 2 rooms on the first floor and 2 rooms, a washhouse and WC on the ground floor, with a basement cellar. It was in fair repair. George Sanders, originally a shoemaker (1839), later a painter & glazier (1851), then a landed proprietor (1861) and annuitant (1871) lived at this address until 1881. His wife Sarah (nee Wright) was recorded as ‘wife of a shoemaker’ in the 1841 census, no sign of George. According to his descendant, Fiona Sheehan, George died on 28 May 1881 shortly after the census. He is almost certainly the son of the George Sanders who owned properties in this area and who lived at no. 307. See the Sanders family page for more information about this family. In the 1909/10 Valuation no. 305 was described as the same as 304 but with an old greenhouse at rear. Trade directories from 1928 and 1933 confirm William Joseph Haywood was at this address. Nobody was recorded here in the 1940 trade directory. There was an old greenhouse to the rear of no. 305 when the 1909/10 Valuation took place. In 1933 there were a couple of other Haywoods at High Street addresses: David at no. 1 near Kew Bridge Road and Francis, a hairdresser, at no. 335 on the corner of Moore's Alley. 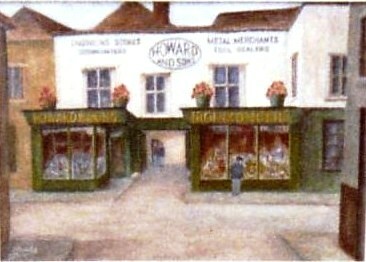 There are earlier references to the name (and Hayward) on the High Street. A bakers run by William Clark in 1839, 1841 and 1851. In 1861 a confectioners, run by Charles Begley who employed 6 men and 3 boys (he moved to no. 57 by the time of the 1871 census). In 1871 Zilpah Earee, annuitant lived here: she was a daughter of the George Sanders who lived at no. 307 in 1841. Zilpah Sanders married William Earee at Brentford in 1851. See the Sanders family page for more information about the Sanders and Earee families. Edward Sales or Scales (the census entry shows Edward Sales and Charlotte Scales, his wife), a coachman, born Lingfield Surrey, lived here in 1881. In 1890 William John Dawes, basket maker lived here and he is recorded in census and trade directories up to 1940. The 1939 Register shows William was a basket maker (retired), born in 1860. His son Arthur J, born 1891 and married to Helen, both living at no. 309, was a scientific instrument maker – a mark of the changing times. William John Dawes was also recorded as an orderly at the Percy Hospital, Isleworth, from September 1915 to December 1918 (Red Cross Volunteers’ website). He is remembered by a descendant of the Sanders family. The 1952 electoral register shows the family remained here: Arthur J Dawes, Arthur T Dawes, Helen Dawes and Marjorie Dawes. In 1909/10 the property was described as a brick built and tiled house in three floors. It had one room on the top floor, two rooms on the first floor and ground floor. It also had a brick built workshop and washhouse with galvanized iron roof and a cellar I the basement. The main building was ‘old’. See Photos/Ephemera/Maps for a link to a 1945/6 photo of this property and earlier photos from Andy Dawes. George Sanders lived here in 1841, followed by his son John Sanders, cordwainer or bootmaker, in 1851 and 1861. See the Sanders family page for more information about this family. In 1871, 1874, 1881 & 1891 this was a beerhouse run by George Clifford Pearce. The 1909/10 Valuation returns describe it as owned by Harman & Co, who also owned no. 306, occupied by Albert T? Pearce and described as a ‘brick built tiled & slated beerhouse. Old ...dilapidated sheds & stables in yard’ formerly sold in 1898. It was called the ‘Alexandra’ but there is a note dated February 1913 ‘not now licensed’. It had a ‘passageway on flank’ (visible in tithe map of 1839 and later maps) and ‘first floor extends over same’. In 1913 (directory) Walter Sturgeon, beer retailer lived here (the directory was presumably complied in 1912). William T Dawes lived here in 1928 & 1933. Not listed in 1940. Samuel Sacret owned numbers 308 – 310 in the 1909/10 Valuation. The 1909/10 Valuation Returns describe each of 308 to 312 as a terrace house & shop of 3 storeys. There is a note under no. 312 ‘Vaults run under the gardens of 308 – 312 inclusive & are used by brewers – with exit in Lee Yard’. No. 308 was uninhabited in 1841. In 1911: no. 308 was an unoccupied shop. The 1909/10 Valuation describes 308 as a terrace house and shop of three storeys, a very old brick built house and shop in dilapidated state of repair. Sheds at rear. Frederick Sargeant, undertaker 1928. By 1933 Frederick Sargeant, undertaker used both 308 and 309 and remained here in 1940. William Gutteridge was recorded as occupier in the tithe return, and Miss N Lees in the next plot. In the 1841 census a William Gutteridge and Mary Lees were recorded living in the same property. Edward Jeans, musician and family and Francis Thompson, clerk in orders perpetual curate of Old Brentford lived at or near no. 309 in 1841. Mason’s 1853 directory includes ‘Edward Jeans, professor of music (organist of Ealing Church and St George’s Chapel), Ealing Lane’. Occupancy in 1851, 1861 and 1871 may be Mrs Mary A King, proprietor of houses; Robert Emmerson, barge owner; William Gammage, bootmaker (master). By 1878 the properties were numbered and the George Hopkins, tailor recorded in the trade directory of this year remained here in 1881 and 1891. The National Archives include the following catalogue entry for documents held at London Metropolitan Archives: ‘No. 309 High Street, Brentford. Lease (14 years) Sml. Sacret Esq. to Mr. P. Knight. ACC/0869/086 1900’. Ground floor: shop, parlour, washhouse, WC. Front and back elevations need pointing. This is old property. Note added ‘To Let’. Information obtained from tenant of no. 310. Also see notes for no. 308 from 1909/10. 1911 census: Herbert Ernest Cobb, a pharmacist and ophthalmic optician born Framsden, Suffolk, lived here with his locally-born wife of four years, Ellen Phoebe. He worked from home, the property had five rooms. By 1933 Frederick Sargeant, undertaker used both 308 and 309 and remained here in 1940. Viv wrote in January 2017 to add ‘We know from electoral registers that Henry and his wife Winifred (née Barrett) lived at 309 High St between 1932 and 1937. Henry grew up in Hammersmith and Winifred was born and grew up in Brentford. From this site we know that a funeral parlour operated out of 308 and 309. That explains why my father-in-law (Harold Henry Porter born 1923 at Shepherd's Bush) remembered playing among coffins! We always assumed the funeral parlour was run by family, but not the case.’ Henry Porter features in a 1930s photo. Occupants from 1881, by which time the High Street was numbered, should be accurate. Earlier occupancy is less certain. William Gutteridge lived either here or in no. 309 in 1841 and 1851, in 1851 he was an estate agent and valuer. 1861: William Croxford, collector Brentford Gas Co.
By 1881 Miss Alice Mary Boddy, dressmaker lived at no. 310. 1890 trade directory: Mrs Sarah Apted, dressmaker and the following year a household headed by Thomas Apted, gas fitter, age 27, born Tonbridge Kent. In 1901: Alfred Dyerson, watchmaker, he was 31 and had a live-in male servant. By 1907 Joseph Cole Clarke, watchmaker who is recorded at this address in 1913, 1928, 1933, then Mrs Clarke in 1938. No reference to this property in 1940. The 1909/10 Valuation describes 310 as a terrace house and shop of three storeys. Front and back elevations need pointing, This is old property but in fair repair. Tenancy was for 14 years from 1898, rent £30 p.a. Also see notes for no. 308 from 1909/10. Following the High Street numbering, in 1878 William J Gammage, boot maker, also in 1881. Herbert Ernest Cobb MPS FSMC FIO, pharmacist & optician is recorded at this address in trade directories for 1913 to 1933. He was living at no. 308 in 1901. In 1909/10: terrace house and shop of 3 storeys with cellars. Ground floor: double fronted shop, kitchen, scullery. Basement: 2 cellars, washhouse at rear WC. Front elevation wants pointing. Premises in poor repair at 1909, since put into good decorative repair. Weekly tenancy, rent £48 p.a. Also see notes for no. 308 from 1909/10. The tithe enumeration shows a John Sanders living at what I think became no. 312 (a house, stable and yard) and the 1841 census shows John Saunders, vet surgeon, is recorded in this area (age 55), also in the Pigot directory for 1839. Assuming he dealt with horses, not just small animals, he would need premises including stabling, so it seems likely he lived here. In 1878 trade directory and electoral register: Benjamin Gregory. By 1881 John William Abraham lived here, occupation art dealer (1881), antique furniture dealer (1890), china dealer (1891, age 62). London Evening Standard 27 June 1896: Henry Paddle, builder, 312 High Street Brentford, had a receiving order placed on June 22. A Henry Paddle lived at 336 High Street in 1891 and 1901, it is possible the newspaper got the house number wrong. By 1901: Mrs Emma Desave, wardrobe dealer. 1909/10 Valuation: Terrace house and shop of 3 storeys & cellar. Accommodation of this property as no. 311 plus old timber sheds at rear. Front elevation and back elevation want pointing. Old property. Note: vaults run under the gardens of 308 – 312 inclusive & used by brewers – with exit in Lee Yard. Tenancy term: 3 years from 1908. 1911 census: John Powell, 38 greengrocer; wife Kate 34; children Percy 9 and Marion 6 occupied no. 312; plus Nellie Reynolds, wife’s sister, domestic help, age 29. The sisters were born in Spalding, John Powell in Isleworth. The property had 6 rooms. It is possible that In 1928 and 1933 the two different businesses were carried out from 312 and 312a. The 1909/10 Valuation for no. 313 includes reference to a shop (no. 313) cottage, rooms over the arch (312a) and stables for 15 horses. ‘That part of building which is over the archway let separately contains two attics on the top floor, two rooms on the first floor also a washhouse.’ Annual rental of the rooms over the arch: £10. The archway was 10’ 8”. The 1871 census names this area as Bowdens Gateway. Maps show a square yard running behind numbers 313 onwards with buildings around it – presumably mainly sheds and outbuildings. Difficulty in getting people to fit in to High Street properties in earlier censuses may be due to there being one or more dwellings accessible via the entry under 312a which were counted as part of High Street. Caroline Hill’s great grandparents George & Kate Harrison, lived in the property over the archway, which was numbered 312a, between 1907 and 1937. See no. 313 for details of the property as it was around the time they moved in. See below for a link to a couple of photos provided by Caroline showing the property and area in the 1930s. The 1871 census names the archway entrance as Bowdens Gateway. There is no reference to 312a in trade directories for 1907, 1911 or 1914, nor in the 911 census. Earlier occupancy is uncertain. William H. Allen postmaster, lived near here in 1841, 1851 and 1861 (in 1861 he was 73 and living with James Parker, a coachman). I am not sure what premises a postmaster required, and he may have lived in a different place to where he worked, so 312a may have been adequate. Alfred Bissell, wife Elizabeth and daughter Alice aged 2 lived here in 1871. He was a general dealer in 1871, an ironmonger & rag merchant in 1874 (directory) and general dealer in 1881, by which time he had 6 children aged 3 months to 12 years old. The property was used by Walter Voysey, florist, according to an 1890 directory, but he may not have lived here as no, 313 was unoccupied when the 1891 census took place. In 1901 George Payne, born Kilburn, a hairdresser, lived here with wife Sarah and two infants. 1907 trade directory records Thomas Fagan, hairdresser at this address. It was a terrace house and shop of 3 storeys: Ground floor: small shop, side room with frontage to High Street, old kitchen and 1 room. That part of building which is over the archway let separately, contains 2 attics on the top floor, 2 rooms on the first floor, also a washhouse. Old stables at rear with accommodation for about 15 horses. To let. One of the attics runs over no. 314 by about 4’. Small advertising station on front wall of 313. This is very old property, is dilapidated and in a very dirty condition. The 1911 census shows Thomas R Fagan, barber, working from this address. He had a wife Ann and a ‘lather boy’ locally born James Ruff, age 15, lived in. The property had seven rooms. Walter Hopkins, ironmonger, is recorded here in 1913 and also in 1928 and 1933 with no occupation. The 1940 trade directory has no references to properties numbered 310 – 317 inclusive, suggesting they were empty or demolished. In 1841 James Melvin, hairdresser, lived here with his wife Emily and three children, an apprentice and female servant, sharing with the Key family of three. By 1851 James Melvin had died, leaving Emily running a perfumers. She had three daughters and a son at home, a niece Eliza Whetherly from Isleworth and a shopman, Henry Hearn, a hairdresser, presumably had taken over from James Melvin. The property was shared with Thomas Banister, a Chelsea Pensioner, and his wife, both in their 70s. By 1861 the Melvin family had moved away and the hairdressing business was run by Richard Hodges, who remained here until 1878 (trade directory), by which time the High Street had been numbered, confirming his address as 314 High Street. In the 1881 census Robert Goodman (45), a furniture dealer lived here with his wife, Alice and granddaughter Alice aged 3, plus Alfred Hart, a 12 year old errand boy. By 1890 (trade directory) Ralph Randall, stationer is recorded at this address. In the following year’s census no. 314 was uninhabited. The 1901 census shows Robert H Andrews, a Holberton, Devon-born man, a railway porter living here with his Brentford-born wife Harriet and family of four aged 14 to 21. Harriet was a tobacconist working from home, indicating the property retained its shop. In 1907 Mrs Harriet Andrews, tobacconist, was recorded at this address. The 1909/10 Valuation shows this was a larger than average property: a terrace house and shop of three storeys with two attics on the to floor, four rooms, on the first floor, a shop, side room with frontage to High Street, parlour and washhouse on the ground floor, a WC and cellar under the kitchen of no. 313 (which had the same owner as 314: William Lee). 314 had a very small yard and was very old property. One attic of no. 313 overlaps these premises. The 1911 census shows Harriet was widowed and running a tobacco and confectionery ship from home. Three grown up children remained at home: William Andrews (28) gas fitter with the Gas Company, and sisters Edith (32) and Florence (26), dressmakers assistant (worker) and dressmaker (employer) respectively. The property had eight rooms. Trade directory entries show later uses of no. 314: Mrs Jessie Wootton, tobacconist (1913); Mrs Constance Wemyss, confectioner (1926 & 1928); Charley Pates, confectioner (1933). There is no reference to no. 314 in a 1940 trade directory. In 1841 William Layton, cow keeper lived at the first occupied property to the west of the Red Lion with his wife Charlotte and four children aged up to 5. The property was shared with William Barnes, coachman, 30 and his wife Ann and baby son William, 1. Over 70 years later the 1909/10 Valuation refers to the property having a coachhouse and stable, which fits with the occupation of William Barnes. John Gregge, stationer and newsagent from London lived here in 1851 with his wife Charlotte and 8 children. The family had moved into Brentford about 4 years previously. In between 1851 and 1861 John’s wife Charlotte died (there is a death registration of Charlotte Gregge in Brentford in 1852), John remarried Catherine (who was born ‘on board ship in the Irish Channel’) and John died (death registered in 1854, Brentford), leaving Catherine as head of household in 1861 and running the stationery business. Catherine Gregge is recorded at no. 315 in 1871 and in an 1874 trade directory as a stationer. In 1881 her step son Henry, who was a butcher’s assistant in 1861, was running the business with his wife Alice Maud Mary nee Frost. (There were Frosts living with the Gregge family in earlier censuses). By 1890 the Gregges had moved away and James Lockley, dairyman born in Ipswich, Suffolk had moved here with his wife and 10 children (aged 6 months to 14 years in the census in 1891). In 1901 John W Osborne, a widowed confectioner born in Hull is recorded at no. 315 with three children, including Tom S, aged 20, a dairyman. In 1907: John William Osborne, confectioner. There is a photo of John, possibly his daughter Margaret, a lad and a small child (D22) from the early 1900s; the caption states the first reference to the Osborne’s dairy was in 1897 and the family owned the property until 1931. The 1909/10 Valuation indicates the owner was William Lee of 73 Bell Street, Henley on Thames: he also owned numbers 313 and 314 and stabling behind these properties. John William Osborne was recorded in the 1911 census, age 56, dairyman, with his second wife Agnes, age 36 and three youngsters: Albert Victor (4), Edward Percy (2) and George Charles (9 months). In this census John gave his birthplace as Wisbech, Cambridgeshire; his wife was from Little Dunham, Norfolk; they had been married 5 years and their home had 7 rooms. Their marriage took place at Little Dunham, Agnes’s home, 25 March 1906 (Ancestry) – quite a trek from Brentford. So was Agnes the woman featured in the two photos taken in the early 1900s? (see links below) The births of their children were registered at Brentford: Albert Victor April-June 1907; George Charles July-September 1910; Agnes Eleanor October-December 1912; and Matthew Freddie Andrew October-December 1916; in each case the mother's maiden name was recorded as Horney, matching the name from the 1906 marriage. The birth of Edward Percy, who appears in the 1911 census age 2, was found in the first quarter of 1909, the maiden name of the mother entered as Horley. Trade directories list John William Osborne, corn dealer (1913) and grocer (1928). There is no reference to no. 315 in trade directories for 1933 & 1940. The 1841 census shows two uninhabited properties next to the Red Lion; likely to include no. 316. By 1845 a William O’Hara, butcher was living in Old Brentford and by 1851 he was living at 316, employing a man and 3 boys. In 1861 Mrs Matilda O’Hara was head of household, and had 3 assistants living in. In 1871 William O’Hara junior (aged 24) headed the family in the census, but the business continued in Matilda O’ Hara’s name in 1874 (trade directory) and 1881. An advert appears in the 1889 St George’s Parish Magazine for ‘William Lee (late O’Hara) Family Butchers 316 High Street, Old Brentford, also at New Brentford, established 50 years’. The 1891 census shows William Lee, butcher, age 42, heading a household of 13 including 4 servants and a visitor. He was from Camberwell, Surrey. In 1907: Thomas Goring, butcher. In the 1909/10 Valuation Returns the property is described as a terraced house and shop of 3 storeys, with a frontage of 27’ 5” (most High Street shops had a frontage of 11’ – 15’). William Lee was the leaseholder & the lease expired in 1924 – he paid a rent of £40 per annum. ‘Although this property is very old and is constructed of brick and wood with a tiled roof it is in very fair repair.’ One room on the top floor and one room on the first floor of number 317 are over the shop of the property. There was a slaughter house to the rear. Frederick William Jones, butcher, had his business here in 1913, 1928 & 1933. Not listed in the 1940 trade directory. This property is sandwiched between a long-standing butchers at 316 and the entry to The Red Lion. The 1841 census shows two uninhabited properties next to the Red Lion; likely to include no. 317. In 1851 James Thick, coach painter, 30 lived here with his wife Sarah (28 and born in Shefford, Bedfordshire), two year old son Joseph (a scholar!) and 2 month twins, Sarah and Martha. Father and children all born Old Brentford. Ann Jeyes, 13, was a live-in servant, she was also born in Old Brentford. In 1861 the house next to the Red Lion was shared by two families: Freeman Page, 49 and wife Eliza, 35; William Harris, 22, sawyer and wife Elizabeth, 21. Eliza Page and William Harris were born in Great Missenden and Little Missenden Buckinghamshire respectively, so may have been related. By 1871 the property was occupied by Frances Howell, widow of 46, a housekeeper, and her son, Frederick Howell, 2(3? ), ‘manager to oil and color shop’. Mother was born Lowestoft, Suffolk, son Islington. A 1878 trade directory includes Davies & Evans, oil and colormen at 317 High Street. The 1881 occupant was Edwin Elliott, oilman manager, 32 born Bury St Edmunds, Suffolk. Living with him were his wife Matilda, 32, born Wellsbourne Warwickshire and three children age 8, 6 and 2, only the youngest, Richard London Elliott, was born in Brentford. An 1890 trade directory shows the business as Davies & Evans, oil and colormen and the occupants the following year: Edward Heard, oilman manager, 30 and wife Emma, 29, son Harry 12. The property was uninhabited in 1901. Ground floor: long shop, WC, shed at rear. Very old property of brick and wood construction with tiled roof. Modern drains. The property was owned by Thomas James Foster of 74 Friern Road, East Dulwich and had a small frontage on the ground floor: just 10’ 9”, a plan shows numbers 316 and 317. A 1907 trade directory records Bright’s Stores Limited, oil and colormen. The occupant at the time of the 1911 census was James Franklin, 33, shop manager, living with him was his wife of 8 years, wife Eliza and daughters Evelyn (7) and Gladys (5), the girls were born in Brentford. The property had 4 rooms. 1913 and 1914 trade directories include entries as in 1907. A 1926 directory shows a change in business: Albert Brett, confectioner, and in 1928 Albert W. Brett, confectioner. By 1933 no. 317 was the business premises for Miss N. Lawes, confectioner, who was also recorded at this address in trade directories for 1937 and 1938. Numbers 310 – 317 inclusive are not listed in a street index for 1940 and photos of the Red Lion from later show a gap next to it. The Access to Archives web site contains several C17 - C20 references to the Red Lion in Brentford (I). In the 1841 tithe apportionment the Red Lion was owned by Douglas Thompson, who owned several other Brentford public houses. A public house & premises (including forge) frontage 50’. Owner: Fuller, Smith & Turner, copyhold. Term: yearly, 1 months notice, rent £160. Ealing Road	between numbers 318 & 319. Ealing Road was known as Drum Lane, after the public house on the corner, up until the 1871 census. By 1881 it was renamed Ealing Road.